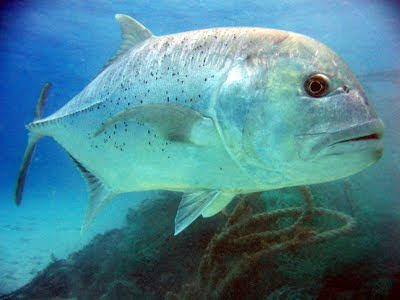 The Cocinero or Caranx vinctus is relatively small saltwater fish from the Jack Family (Carangidae). Sometimes referred to as the Barred Jack or Striped Jack, this fish is found in the tropical waters of the eastern Pacific Ocean in coastal waters. Cocinero fish can be identified by the 8 or 9 dark stripes that run along their sides. Theses fish can grow to about 15" (38cm) in length. They are carnivores that prey on smaller fish and crustaceans. Cocinero are considered to be a great fish to eat in South America and are served fresh, dried or salted and caught with nets and spears. If you have any additional information about the Cocinero please leave us a comment below.